41-year-old Faye Ku is accused of faking documents for a court-ordered visit. Authorities are asking for the public's help in searching for two missing children who were believed to be abducted by their mother and were last seen arriving at Los Angeles International Airport from Washington. 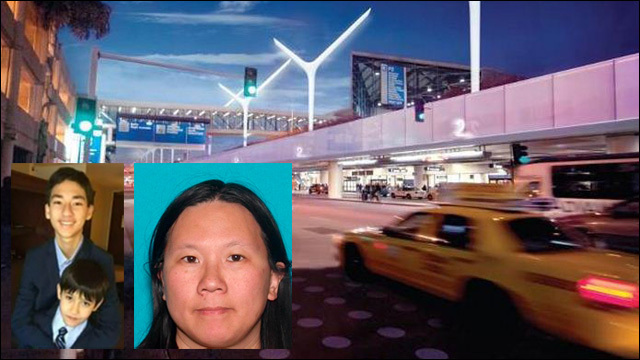 41-year-old Faye Ku is accused of kidnapping her sons when they arrived at the airport last Friday. The boys, 14-year-old Sage Cook and 9-year-old Isaac Cook, had flown from Washington where they live with their father who has had full custody of them since the couple divorced in 2009. According to the Los Angeles County Sheriff's Department, Ku had submitted an apparent court order to grant her a supervised visit with her sons, which prompted the visit. But it turns out the documents were fake. Investigators are treating the case as a suspected parental abduction. Sage Cook, 14, and Isaac Cook, 9, were last seen with their mother at Los Angeles International Airport upon their arrival Friday. Ku, who lives in Lakewood, disappeared with the boys and left behind a letter blaming the children’s father for trying to control them and asked him to leave them alone, according to the Sheriff’s Department. Ku also has a 2-year-old son named Zephyr Ku, who may be traveling with them. Zephyr Ku is the half-brother of the missing boys, according to the Sheriff’s Department. Ku attempted to leave the country with Sage and Isaac once before, but was detained before boarding a flight to Taiwan in 2013, according to court documents. Ku is described as a 41-year-old woman of Chinese descent, standing about 5 feet 3 inches tall, weighing 180 pounds with black hair and black eyes. Anyone with information about the incident is asked to contact local law enforcement or Detective Gabriela Hernandez of the Lakewood Sheriff's Station at 562-623-3500. Anyone wanting to remain anonymous can also call "LA Crime Stoppers" by dialing 800-222-TIPS (8477).